Last year was pretty an eventful one. Once again, C4D Lab through the University of Nairobi hosted the 4th edition of the Nairobi Innovation Week in March. Folks, this was one of a kind. The event saw over 2,000 delegates come together to promote innovation. 50 plus international speakers also flew into Kenya to grace the event with over 100 local and international exhibitors showcasing their innovations. Who knew someone would walk away with a cool Ksh 1 Million? Yes just like that! The NIW.Startups day was packed in the best way ever as innovation met fun. It can only get better in 2019. Let’s see how things shape up for NIW 2019. 2018 was amazing for C4D Lab. We emerged as a winner of the Global Urban Mobility Challenge 2018 by the Transformative Urban Mobility Initiative. (TUMI) This of course has come with its goodies in 2019! We have set up Kenya’s first mobility accelerator which is set to unlock new opportunities and solve the urban mobility challenges in African Cities. Six startups have already been admitted into the accelerator set to be officially launched on 24th January 2019. These startups are a thing to watch out in 2019 especially with the talk of Kenya introducing BRT’s among other transport projects set to redefine mobility in Kenya. The signs are as clear as day that Problem Based Learning is the next big thing for the Kenyan education curriculum and we are here to set the pace. We have rolled out a flagship Multi-Discplinary Problem Based Learning for Educators programme whose application is ongoing. This is part of a larger initiative to bring together multidisciplinary teams to develop sustainable solutions for community challenges. The MD-PBL for Educators aims at strengthening capacity of academic staff to run effective problem based learning programmes in a multi-disciplinary format in their institutions. Ladies and gentlemen, this will be a ‘baby’ to watch out for in 2019. A catchy year as it may have been, in 2019 we are focusing on increasing students’ participation in the Nairobi Innovation Week through active participation. We are set to roll out a students’ challenge and drives to discover students’ innovations and ideas. 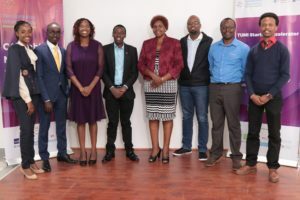 Selected ideas will be exhibited and showcased during this year’s edition of the Nairobi Innovation Week. Are you a student pregnant with ideas but lacking a platform to express them? Keep on checking out our website and social media platforms for updates on this. Expectations are high this year and as always we will be tabling more this year including launching our just renovated space at C4DLab. We’re just getting started. Watch out!